The Black Soft Touch Vistana pairs a classic look with the uncompromising durability of our trademarked Soft Touch finish. 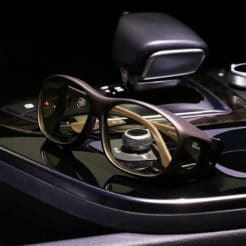 The gray lenses retain true color representation while cutting glare and harmful UV rays, and the popular and comfortable Med size fits a large range of prescription eyewear. Polarized UV400 – Scratch Resistant – Flex2Fit Temples – Lifetime Warranty-Fits over prescription frames measuring less than 135 mm in width by 42 mm in height 5 5/16 inches in width by 1 5/8 inches in height. Each Vistana includes a soft protective case, lens cloth and limited lifetime warranty.